Summary: "Once, a hero arose to save the world. A young man with a mysterious heritage courageously challenged the darkness that strangled the land. Yet somehow, hope survives. Hope that dares to dream of ending the empire and even the Lord Ruler himself. A new kind of uprising is being planned, one built around the ultimate caper, one that depends on the cunning of a brilliant criminal mastermind and the determination of an unlikely heroine, a street urchin who must learn to master Allomancy, the power of a Mistborn." 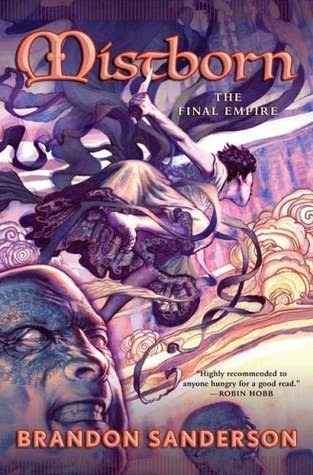 Review: Mistborn has been sitting on my nightstand for... a long time. I don't even know how many months. After ignoring it in favor of something else for a very long time, Cassie at My Thoughts Literally gave me the push I needed to finally give this book a go. And I'm glad I did, because by the end of this book, I was in love. At its inception, the world of Mistborn is kind of how you might expect Middle Earth to look if Sauron had beat Frodo and company. It's dark and oppressive and full of bad guys. There is a Lord Ruler (main bad guy) and a dozen or so ruling houses (comprised of other bad guys) who live in wealth and luxury, and who seriously oppress a large group of people called the skaa. A few of these skaa want to change things. That's the simple version. The real story is much more nuanced and complicated, which made it delightful to read. I really liked how extensive this world building was, and how complicated the politics and magic system were. It was slow going in the beginning, and I think probably should have been edited down a little. But once I got a handle on how this world functioned, I was completely drawn into the story. I grew to care for the characters quite a lot, a fact that became clear to me when at one point in the novel several of them were in danger and I found myself suddenly extremely nervous that Sanderson might kill one (or more) of them off. The beginning was so slow that I didn't realize how attached I'd become until later. It was a happy realization, albeit a stressful one since it occurred right when the characters were in grave danger. I blew through the last two hundred pages like a madwoman. I'm glad I proceeded through those earlier slow chapters in order to get there. A few events punched me in the gut, and I'm still recovering from them. So many things happened right in the end that made me feel overwhelmed - in a good way - with the implications of each action. My mind was racing with different thoughts and emotions as I finished the book, and I was still thinking about this book days later - always a good sign. I find that I'm liking it more and more as time goes by as well. It's a book with a good aftertaste. So although the beginning was slower, this book built into a really strong, compelling story that I couldn't get out of my mind for days. Although this book is the start of a trilogy, Mistborn alone had a very clear hook, rising action, climax, and conclusion. It doesn't lean on cliff hangers to make its readers continue to the next two books. I was pleased with how strongly it stood on its own. I will definitely continue the series, and am looking forward to spending more time in this world. Bottom Line: Though it's a little long, the reward is great. Fantasy fans are sure to enjoy this rich world, this complex magic system, these diverse characters, and the political intrigue in Mistborn. YAY you finally read it! I'm so glad you loved it as much as I did :D Sanderson's books always have a bit of a slow start because there's so much world-building, but he really makes up for it, I think. His books are amazing. I was kind of surprised that I liked it as much as I did! The beginning was so slow that I feared I would spend the whole book waiting for it to end, but when it finally picked up I was ALL IN. Thanks for recommending it! !